(S. sisymbriifolium) Large plants grow to 5', and are covered with thorns; sweet red fruit and large white flowers. Lovely to look at, but be careful with the thorns! 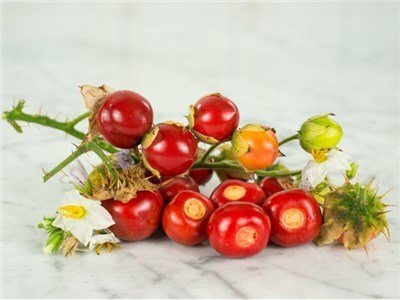 The fruit is about the size of a cherry and taste like a cherry crossed with a tomato. A very pretty and attractive plant that originated in South America, but has been naturalized in many countries. Start plants as you would a tomato.